*Indicative stay 2 nights at the camp. Prices based on two people travelling by private vehicle. The endangered Dorcas Gazelle primarily eats a tall, spiky green shrub (‘garzeem’ in Arabic). You will be very lucky to spot one. The Arabic word for gazelle is ‘rhazal’ and the village of M’hamid El Ghezlane (pronounced rhazlane) is named for the ‘plain of the gazelles’. 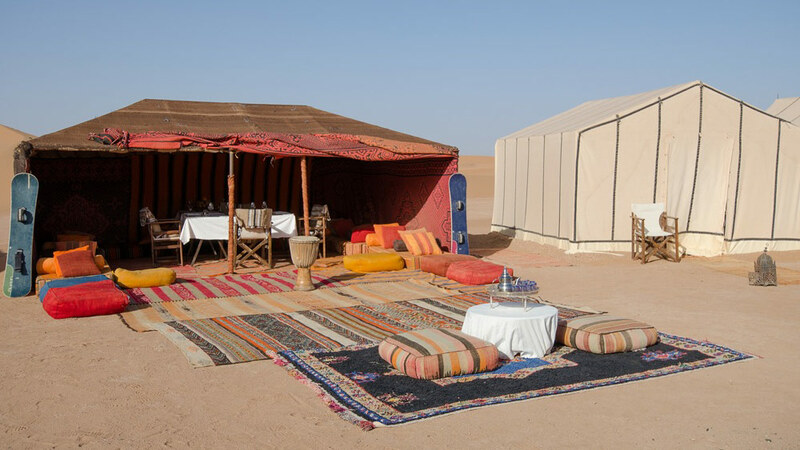 A private desert camp in the remote dunes, to the east of Erg Chigaga great dunes. Two hours off-road drive from civilisation. 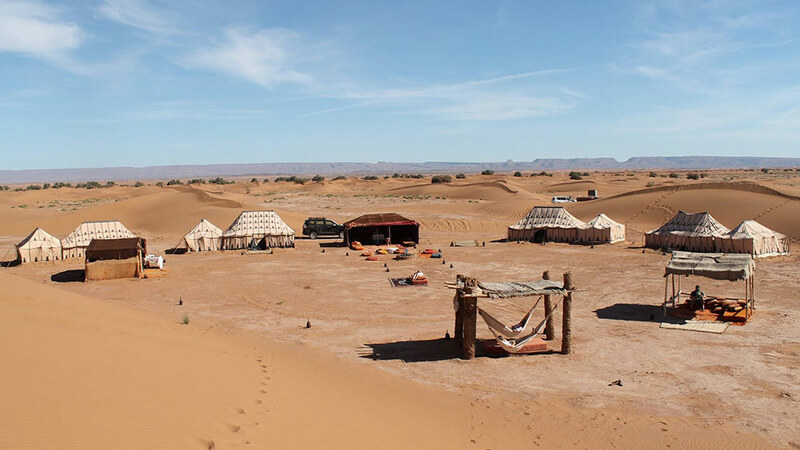 The stay at the private Nomadic camp can be combined with a tailor-made tour or a bespoke self-drive adventure in Morocco. 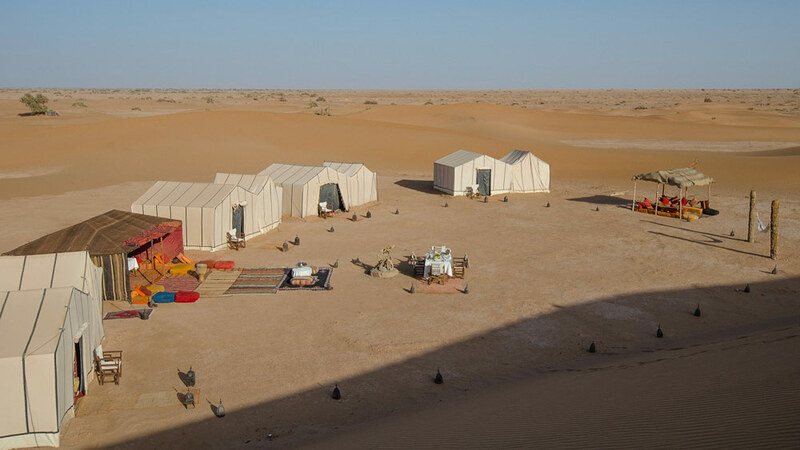 Designed to accommodate a couple, group of friends or a family looking for total escape and exploration, yet in comfort and style, the private desert camp is sheltered by dunes and will comfortably sleep up to 9 people, in four spacious tents. You will not see any other camps in the area. 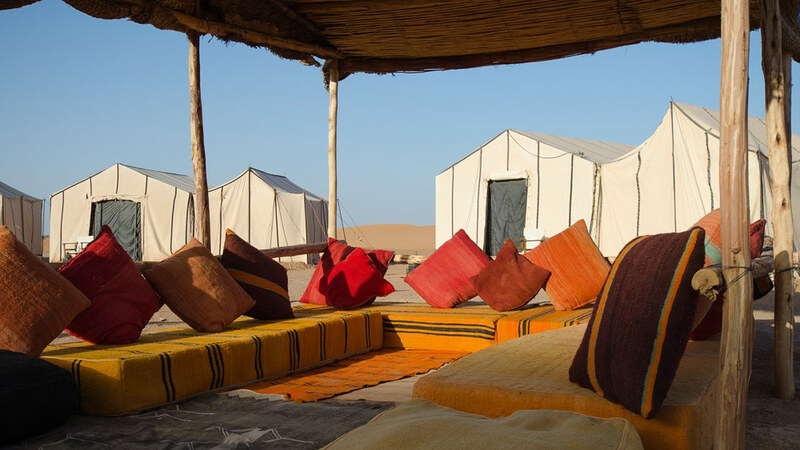 There is plenty of outdoor space for relaxation on cushions, or in hammocks, and the largest dune that overlooks the camp is ideal for enjoying sunset and sunrise (which are an integral part of the desert experience). 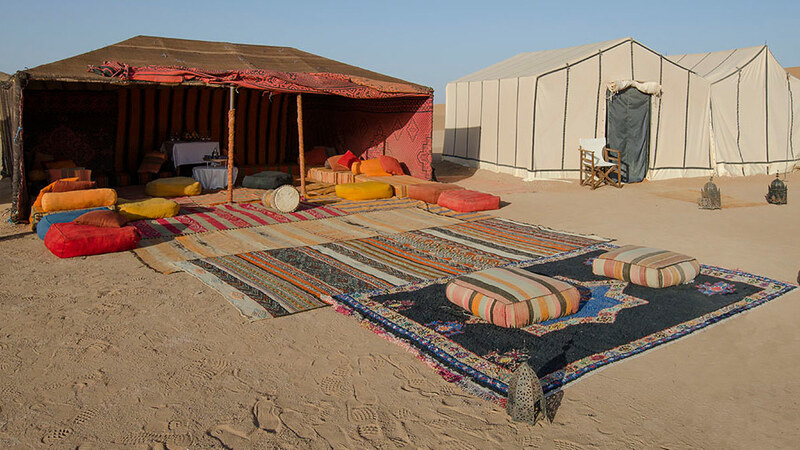 The private nomadic desert camp has all the essentials for an indulgent night under the stars in a truly remote location, including your own staff. The camp’s en-suite sleeping tents each provide king-size beds (or singles), mattresses, the finest linens, rugs/carpets, and of course an adjoining bathroom tent (with showering facility, wash-stand and toilet). 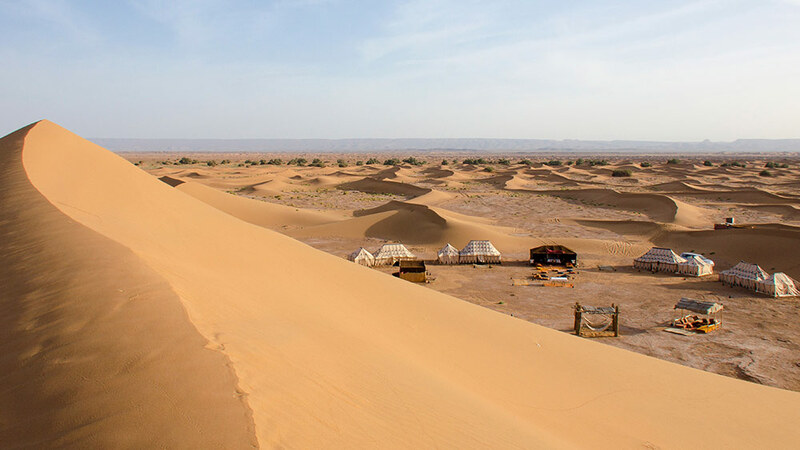 We arrange a number of activities at the camp or out from camp, including hiking, camel-trek, wild picnics, sand-boarding, sunset vantage points with chilled drinks, evening music by the campfire, telescope. 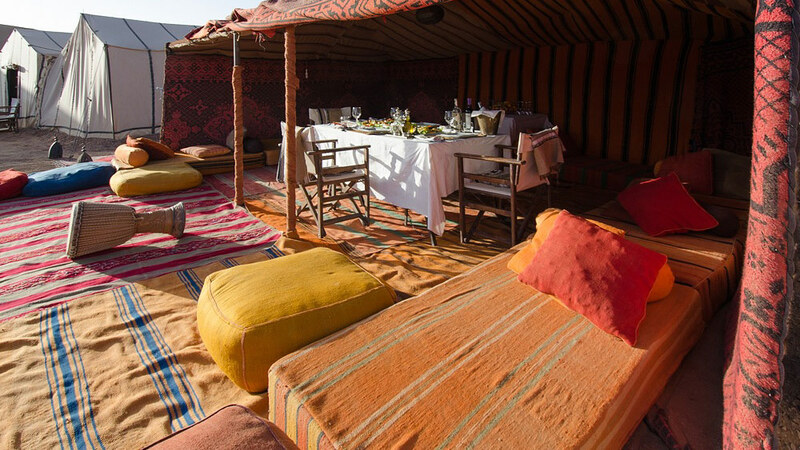 Camel-trekking and hiking in the desert is guided with three-course lunch provided under the shade of Tamarisk trees. Trekking time is approx. 2 hours each day (but can be extended). All meals, drinks (including alcohol) and activities are included in your stay. Transfers from/to Marrakech or Ouarzazate are additional cost. Please do let us know, in advance, if you are travelling with us on honeymoon in Morocco, or celebrating another occasion, and we will ensure to have something extra special prepared for you at camp.